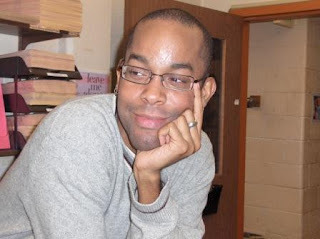 I am saddened to report the death of friend and colleague Chris Bell, who was an important disability studies scholar working in the area of HIV/AIDS, race and ethnicity. He was the former president of the Society for Disability Studies and contributed to important national discussions about race, ethnicity and disability studies. Chris died this week in Syracuse, N.Y., where since August 2008 he was an ARRT Fellow at the Center for Human Policy, Law and Disability Studies at Syracuse University. He was a doctoral candidate in English at Nottingham Trent University (Great Britain) specializing in cultural studies and use of rhetoric in disability discourse. Steve Taylor, Director of the Center on Human Policy and Coordinator of Disability Studies for the School of Education at Syracuse University, said: "Chris was a former President of SDS and was best known for drawing attention to the need for Disability Studies to take into account race and racial injustice. He also raised awareness of AIDS as a disability and subject for Disability Studies. Chris had been here at Syracuse University since fall 2008. He was always thought-provoking, even provocative, and he forced us to consider tough questions." One of his most important articles, in my opinion, was in the Disability Studies Reader (Routledge, 2006) called, “White Disability Studies, A Modest Proposal.” He also wrote a piece early in his career about the discrimination he faced when he revealed his HIV status at a university where he attended graduate school. He told me that's how he became interested in the intersection of HIV/AIDS, disability and discrimination. The Daily Orange, the student newspaper at Syracuse University, did a nice story about Chris and his planned course on HIV/AIDS, his research and activism in November 2008. Chris was honored as a sexual icon of 2009 on the About.com: Sexuality Web site. Prior to his time at Syracuse, he taught at Towson University in Maryland. Here's a video of Chris's going away party at Towson. Chris Bell was a Lecturer and Advisor in the Department of English; an affiliate faculty member in Cultural Studies, LGBT Studies, and the Honors College; and the Advisor of the Queer Student Union. He held a BA in English from the University of Central Missouri and an MA in English with an emphasis in rhetoric from the University of Illinois at Chicago. He was writing his PhD thesis for Nottingham Trent University (UK) on the “spectacle of American AIDS.” Prior to his appointment at Towson in August 2006, Chris lived in Poland where he researched disability access and representation at the museum spaces of Auschwitz and Birkenau. He also taught Cultural Studies classes at the University of Bielsko-Biala and Thesis Writing classes at the Warsaw School of Social Psychology. Chris had 10 chapters in edited collections, 4 journal articles, 34 book reviews, and 39 encyclopedia entries in print or press. He was the editor of two essay collections, both of which were under review at academic presses. He was recently asked to compile and edit an anthology examining the intersections of blackness and disability. It was to be issued in 2009 from Lit Verlag, a German press that specializes in texts on the African Diaspora. In addition, Chris was a frequent invited speaker and conference presenter, having given over 150 talks at (e.g.) Brown, Columbia, Rice, and Syracuse universities as well as the universities of Alberta (Canada), Ostrava (Czech Republic), Sheffield (UK), Warsaw (Poland), and Zurich (Switzerland). Chris was the Modern Language Association’s (MLA) Delegate Assembly Representative for the Executive Committee of the Division on Disability Studies and he also serves on the MLA’s Committee on the Status of Graduate Students in the Profession. He participated in several media projects including an Emmy-nominated AIDS public service announcement for MTV. The New York Times Magazine has referred to him as an “expert” in AIDS prevention and education. His honors included two writing awards – the College English Association-Middle Atlantic Group Graduate Student Prize for Excellence (March 2007) and the University of Rhode Island Department of English Graduate Student Conference Best Essay Award (also March 2007) – and a Mellon Fellowship to attend and participate in the 2007 FMS summer institute at Cornell University. Chris’s teaching and research examined the intersections of identity and social justice. He was particularly interested in how cultural constructions such as race, class, gender, sexual orientation, disability, and nationality inform and inflect individuals’ sense of themselves as well as their cultural experiences and egalitarian pursuits.